TRACE is a great site with some fantastic images and movies. If you go to this link you can download the DVD img files (large MB's) which will allow you to burn a DVD of the entire movie collection categorized by month & year plus solar features i.e. flares, prominences, solar tornadoes etc. There's no music, no scientist talking etc. Just movie after movie of solar everything. It's actually pretty great to have and it's FREE!! It is almost a full time job/joy reading all this information that is available via this site...and more and more is piled on every day..
Could not help but seeing a Birklands terrella, it just makes too much sense. *uh why am I having such troubles posting images on the site??? 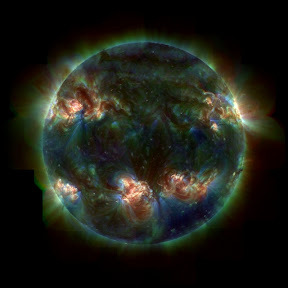 You get a great multispectral image of the Sun! Ohh yeah, that's the stuff! Once you've got the Birkeland Terella in mind, it's hard NOT to see it, when looking at images like this. Perfect doubly banded image... Very nice. Though we probably don't need to have 2 of the image on the same page of posts (ups download time for those on dial-up, methinks)? Could probably take down one of the two. Anywho... Still, good stuff! Okay, just to get them all on the same page, let's do another quick compare/contrast. 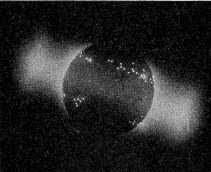 When you mentioned [the images and/or movies of solar flares] it brought Birkeland's terella experiment to life in relation to the Sun's solar cycles. So, what say ye' one and all? Good stuff? Sorry, that's all I'd saved to my local hard drive. as i understand it, the earth is a negative body moving in a relatively positive plasma, and lightning is the discharge caused by the resulting electric field. but according to standard references on lightning, there is both positive lightning and negative lightning. isn't this a contradiction in electric earth theory? how can lightning can go both ways when the electric field only goes one way? Last edited by nick c on Sat Mar 26, 2011 8:19 am, edited 1 time in total. the electric field moves both ways....electrons move in one direction while protons or positive charged ions move the other. yes but in normal lightning, electrons move down and ions move up, while in positive lightning they both go the other way. Although most lightning originates in the negative charges at the bottom of storm clouds, roughly 1 in every 5 lightning strikes originate in the positive charges near the cloud tops. This results in an energetic positive cloud-to-ground discharge, in which the positive charge is neutralized by an upwards flow of electrons from the ground. The negative charges left in the lower part of the cloud set up what physicists call a "quasi-electrostatic field"- an intense electric field that extends high into the atmosphere above the storm. "There is absolutely no question in my mind," says Umran Inan, director of the Space, Telecommunications and Radioscience Lab at Stanford University. "Sprites are caused by QE fields." The sprite lies above horizontal (so-called spider) lightning in the lower portion of the upper stratiform cloud. The spider lightning's large horizontal extent shows the size of the large layer of electric charge that feeds the positive ground flashes. Such lightning flashes are not generally seen in ordinary isolated thunderclouds. Other unanswered questions remain. The extraordinarily rapid initial growth of sprites is not well understood. Nor is the pronounced asymmetry between the number of sprites produced by negative lightning and the number produced by positive lightning. Only two sprites have ever been clearly associated with flashes of negative cloud-to-ground lightning, whereas the number of sprites verifiably produced by more energetic positive cloud-to-ground lightning runs to thousands. Obviously, there is still much to learn. The critical breakdown limit for air depends on its density. At very high altitudes-about 75 kilometres up-where air density is low, the QE field now exceeds the critical breakdown limit for air. Electrical breakdown occurs and molecules such as nitrogen and oxygen are ionised, releasing electrons. Under the influence of the QE field, free electrons are accelerated upwards, while positive ions accelerate down towards the ground. Edgar Bering's balloon flights suggest that the currents responsible for sprites may carry far more oomph than anyone had suspected. Previous estimates suggested that the sprite-inducing current carries about 3000 amperes. Bering's data, on the other hand, puts the figure nearer 12,000 amperes. Whether this huge current could pose any direct physical danger to anyone is unknown. Airliners don't fly in the mesosphere, but sprites can reach down into the cloud tops. And it is certainly possible that sprites could affect spacecraft, Bering suggests. Sprites are the prime suspect in the unexplained downing of a high-altitude balloon a few years ago. Almost as quickly as it appears, the sprite fades away, disappearing completely in just a couple of milliseconds. However, the QE field is believed to last much longer. Researchers on the ground can monitor its presence using radio receivers since the field produces a continuous electromagnetic signal at frequencies from a few hertz to tens of kilohertz. The signal often persists long after the sprite has disappeared, slowly fading as charges in the cloud disperse. This electromagnetic signal, Inan and his colleagues argue, is the signature of the QE field. But what scientists needed were direct measurements of the electric field. What could be better than information gathered by a balloon flying high above the clouds? The team scoured the balloon flight results for the signature of a QE field-the low-frequency radio hum. But they were in for a surprise. The balloon's instruments did not record it. The researchers realized the favoured model of sprite formation didn't measure up. 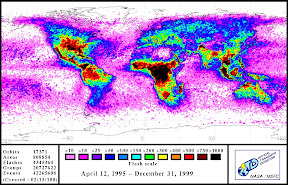 The results from the ground stations suggest that once a positive lightning strike occurs, the intensity of the electric field in the mesosphere builds up over two or three milliseconds until breakdown occurs, and the sprite lights up. This delay may be related to the flow of currents created by the lightning which bring the high-altitude electric field to the level required for breakdown, says Victor Pasko, an atmospheric physicist at Pennsylvania State University in University Park. Then, once the sprite has faded, charges in the clouds begin to disperse or flow away, and the electric field observed from the ground decays slowly over tens of milliseconds. However, the balloon data paints a very different picture. It implies that sprites are produced by a sudden burst of current and there is no slow build-up of the electric field. Several milliseconds after the positive lightning strike, sensors recorded a sudden upward-flowing current pulse. Just 300 microseconds later, the sprite lit up in the sky. To add to the mystery, the electric field disappeared far more rapidly than ground observations suggest, in just a few milliseconds. Bering's results-some of which he presented at the recent American Geophysical Union meeting in San Francisco-turns sprite theory on its head. "The charge that produces sprites is not below in the cloud, it's in the mesosphere itself," suggests Bering. So now there are new puzzles: where could this charge be coming from, and if there's no QE field, what causes the delay between lightning and sprite? "We have a problem understanding why the sprite takes so long to form," admits James Benbrook, a colleague of Bering's in the physics department at the University of Houston. And what of the low-frequency hum picked up by labs on the ground? Bering thinks the signal may be caused by the lightning strike itself rather than the mechanism that lights up a sprite. Researchers on the ground face an additional problem, they are close to one electrical contact of the global electric circuit-the Earth itself. The low-frequency hum could be an artefact and we hear it if we are on the ground when the charges in the clouds flow to earth, Bering suggests. Benbrook agrees. The signal received on the ground is more likely due to the rearrangement of charge in the cloud tops, he says, or the flow of current in the lightning channel. "But I don't see what that has to do necessarily with an excitation mechanism in the mesosphere." Other researchers urge caution in interpreting Bering's results. "At high altitudes the field can be very small," says Pasko. Inan suggests that more sensitive instruments on the balloon may have picked up the hum of the QE field. "Whether or not there is a continuing field signature is a matter of how sensitive your measurements are. It could be there but below the noise level of your instrument." Most sprite investigators agree that Bering should have been able to detect the low-frequency hum, and blame his instruments for failing to do so. Bering defends the quality of his experiment and insists his instruments were working. "We wouldn't have seen the electric signal of the sprite if they weren't." Can the QE field theory recover from this blow? "My personal guess is no," says Bering. "None of the existing models will survive when people finally pay attention to what our data actually says." interesting article, but it doesn't answer my question. or rather, it doesn't address my question. obviously my thinking that the electric field points in only one direction must be wrong. why? 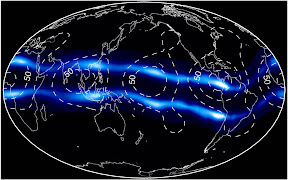 The Electric Universe model suggests that the Earth plays a cathode role in the Sun's discharge and therefore is in the business of supplying negative electrons to space and receiving positive ions from the solar wind. according to this and my naive understanding of the model, we should only see positive lightning -- but in fact positive lightning makes up only 5% of cloud to ground lightning, and the "incorrect" negative lightning makes up the rest! kschalm wrote: interesting article, but it doesn't answer my question. or rather, it doesn't address my question. Likewise, cannot regions of varying charge build up in an insulator (the rocks in the crust of the Earth)? Is it possible that the positive lightning simply happens to create a strong field between the cloud tops and some large sub-surface cloud of negative charge some distance away? I'd assume that due to distance, they field would have to be pretty strong to induce dielectric breakdown over that distance (perhaps a reason why positive lightning is so much stronger than regular lightning; if I recall correctly it is anyway?). A) Earth is positively charged. Atmosphere holds a positive charge at higher levels. B) Negative lightning is far more common than positive. Doesn't answer the question, per se, but perhaps broadens the scope a bit? And things seem a bit less black and white. Thanks for the question, or I'd have not found that most interesting site. wow, michael, lots of food for thought there, especially http://www.nofc.forestry.ca/fire/faq_lightning_e.php which i perused quite thoroughly and learned many things i didn't know. it was news to me that there is an air-earth current which has been known for a long time and even quantified. they aren't 100% sure what drives it, but there seems to be a general consensus that lightning is probably sufficient to drive the process. Theories of thundercloud charge generation are still very speculative. The favorability of one process over another has fluctuated over time due to the inadequate number of laboratory experiments and scarcity of useful field observations.